The new standard of eddy current crack detecion for production and laboratory. Digital eddy current test instrument for nondestructive testing of components, mass produced parts and semi-finished products for cracks, pores and grinder burn using Preventive Multi-Filter Technology and for material properties such as hardness, case depth, structure, tensile strength, heat treatment or alloy using Preventive Multi-Frequency Technology. 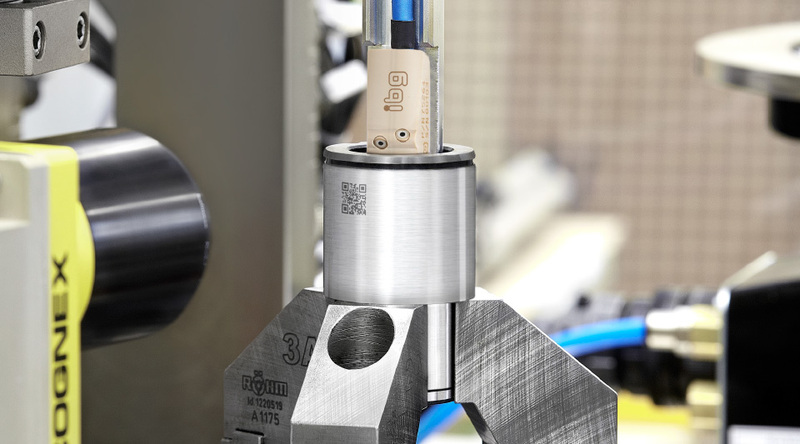 In the field of crack and grinder burn detection, the need for trained experts to perform the sophisticated and time consuming tasks of manual determination and setting of suitable filter band, phase angle and gain is eliminated by ibg’s exclusively developed Preventive Multi-Filter Technology (PMFT), which automatically creates tolerance zones by simply scanning good parts. This quantum leap in eddy current technology, unique to ibg worldwide, establishes a new standard for quality in crack and grinder burn detection by the eddy current method. During material data recording (calibration) with PMFT, surface areas of several good parts are scanned. The good surface eddy current “noise“ is recorded simultaneously in each of 30 band pass filters. Tolerance zones, enveloping 360 degrees, are automatically created within each filter band, capturing the allowable eddy current “noise“ from good parts. Good part noise signals result from allowable variations in surface roughness and material properties. Thus, the thirty tolerance zones store the part specific fingerprint of the good parts. Edge effects, hardness profile run out, eccentricity, etc. of the good parts are calibrated during material data recording. Thus, pseudo rejects are reduced considerably without losing visibility to real flaws. The unique “good-part-only-concept“ enables setup within a few minutes. Simply scan and record an adequate number of good parts. Tolerance zones within each of the 30 PMFT filter bands are automatically generated capturing the allowable noise from the good parts to form good part finger prints in each of the 30 PMFT filter bands. After material data recording, one key press switches to Preventive Multi-Filter Test, and the test can start. Done! Faster starting yet more reliable eddy current testing is not possible. Crack detection probe box for contacting testing on eccentric parts like camshaft lobes for cracks and grinder burn; large diameter range is covered; up to 300 rpm (depending on part geometry), ceramic supports for long life-time. Solutions for structure test on camshafts on request. Efforts to reduce content of valuable raw materials and of energy bring reduced cross sections in high volume components in the fields of mechanical engineering and automobile components. The resulting reduced cross sections and stricter material properties requirements have incentivized manufacturers to guarantee correct structure and crack and grinder burn free condition by increased nondestructive testing. The eddy current test method can be applied for all materials with electrical conductivity or magnetic conductivity (permeability). This includes all metallic materials. The eddy current crack and grinder burn test can be adapted to many test tasks by selecting the suitable crack detection probe and transmitter frequency. As a matter of principle, mainly surface open or flaws close to surface and pores are detected. The test resolution and effective scan width of a crack detection probe is dependent on core size and type (between 0.5 and 5.0 mm). When testing, a relative movement of probe to surface of test part is always required. In order to test rotationally symmetrical parts for cracks, either the test part is rotated and the probe stands still or the test part stands still and the probe is rotated around the part by means of a rotating head. If more than one line shall be tested additional feed forward is needed. Thus complete surfaces can be scanned. 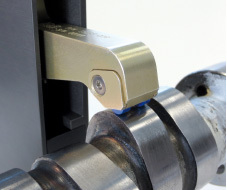 More complicated surfaces require more complicated mechanical handling systems. Our own special machine manufacturing group is always pleased to work with you to design and build a test system for your 100% testing. Steering nut in an automatic ibg test system. Detection of cracks and grinder burn defects on the race inside. With camera inspection system to capture part type specific QR-code. In the past the eddy current crack test would be set to optimally detect an artificially generated (EDM) defect master. But artificial defect masters show different eddy current behaviour (i.e., phase shift, etc.) than natural defects. Thus, natural defects could go undetected. Now the ibg technique with its eddyvisor instrument family walks on new paths. Thanks to the Preventive Multi-Filter Technology the instrument is not set to an artificial defect anymore but to the eddy current pattern of “healthy” surfaces of several OK parts. Automatically 30 tolerance zones over the entire spectrum of filter bands are formed which in fact picture the “healthy” surfaces in the test instrument. As soon as one of these tolerance zones are exceeded by the eddy current signal a NOK signal is triggered, no matter if caused by an artificial or by a natural defect. For proof of test sensitivity, an artificial defect is put into an OK part by EDM processes. This defect must be 100 % detected by the instrument for validation of the method and of the test system. The limit defect of your application is determined beforehand in our lab during a feasibility study. It results in definition of direction and dimension of the smallest reproducible defect that must be 100 % detected without or without significant pseudo rejects. Surface roughness – detection of small defects is better the smoother the surface is. The limit is at defect depth equal to 5 times roughness depth, but not less than 50 μm. Material – use of differential probes generally suppresses noise inherent to different materials. But the material tested is a factor. For example, the detection limit for lamellar cast iron can increase to approx. 150 μm due to carbon needles in this material. Distance probe to surface – increasing probe distance reduces sensitivity, while decreasing probe distance enhance sensitivity to surface roughness and eccentricity of the test part. A good compromise for most applications is the ibg standard probe distance of 0.7 mm. Direction of defects – the direction of a defect relative to the probe trace direction also influences the test sensitivity. This can be influenced by choosing the suitable ibg probe system. 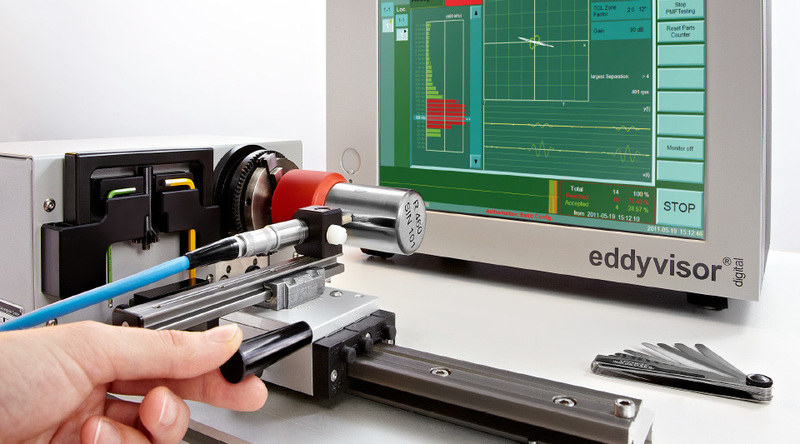 ibg-lathe for lab tests, feasibility studies and small series in crack detection with eddyvisor. Speed max. 850 rpm, chuck up to 68 mm diameter, with trigger sensor, flexible probe movement. off of tested surfaces without sacrifice of test sensitivity and test resolution. The small flaws are detected. Other manufacturers only guarantee similar sensitivity with 0.2 – 0.3 mm probe distance. But probes so close see more good part noise, and there are more pseudo rejects of good parts. In general, differential probes are highly sensitive for local surface defects. They are also relatively immune to variations in test part structure such as different batches, allowable heat teat variations, etc. These characteristics are important for avoidance of pseudo rejects when doing 100 % testing. As per ISO 14104, grinder burn is a local overheating of surfaces. Heat impact during the grinding process was too much and effected localized annealing or, if heat impact was still stronger, there can be re-hardening zones. Depending on part surface quality and geometric influences, the ibg PMFT detects grinder burn with detection beginning at the level of mere change in residual stress or beginning of annealing zones in the microstructure. A method applied by ibg to produce reference samples for grinder burn detection is laser burn: heat, defined and locally applied to the surface of the test part. Thus, producing defined artificial defects of different intensity in metallic parts which show analogue features like real damage. They can widely be produced and reproduced at defined spots according to requirements (kind and depth of structure change, spacial dimension) and they serve as master part for validation of automatic test machine as well as for determination of sensitivity of a test systems. Crack test on 6 positions of a wheel hub, with scanning of the inner and outer surface. Each segment has a set of reference data based on good parts, which are used as base for the tests. 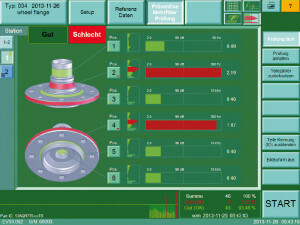 The eddyvisor shows the tested segments in colours according the obtained test result. 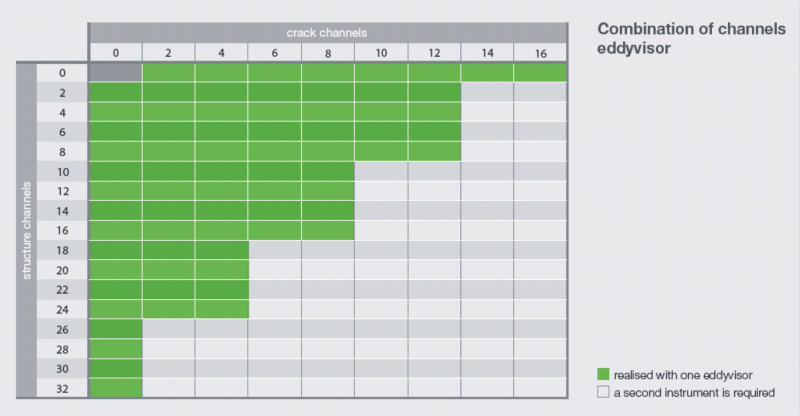 A selection of probes for crack detection is available which vary in trace width, sensitivity and shape. 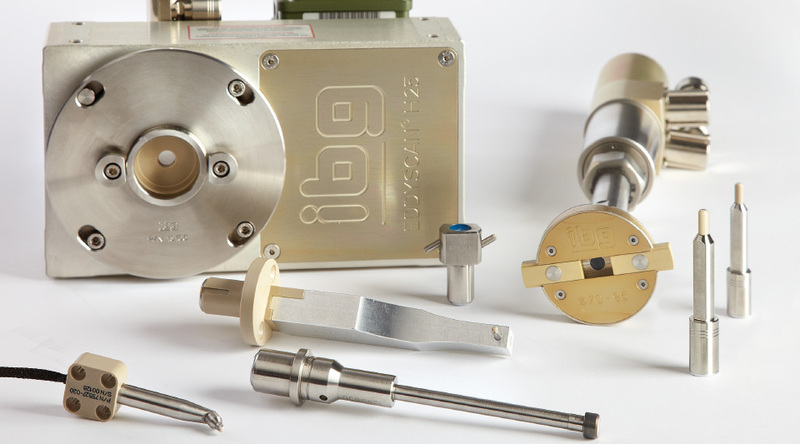 Customised probes for special applications are designed and manufactured in house. Compact and highly precise ibg rotating heads eddyscan H and eddyscan F are available, in many cases installed for optimization of cycle time. 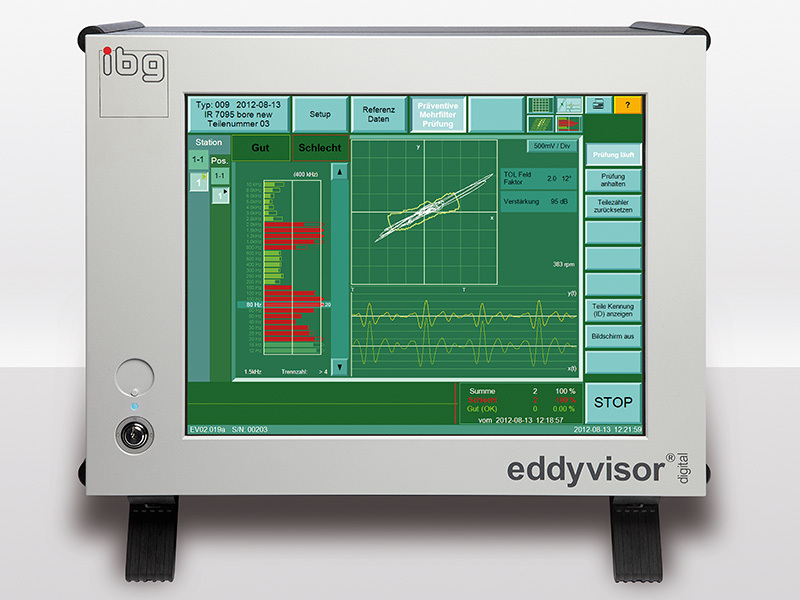 They work together with the test instrument eddyvisor. Cable break monitoring offers high security in continuous operation. ibg probes are by default manufactured for a large probe/part distance of 0.7 mm. Thus, demands on part exactness and test mechanic are relaxed considerably. If a part is very eccentric, the distance of probe to test part may be additionally balanced electronically by use of the optional lift-off compensation. Special lift-off compensation probes are supplied for this function. The suspend function blanks out areas not to be tested like holes or similar. Display of test results as bargraph, xy-diagram with tolerance zones and x(t) and y(t) or three-dimensional C-scan display can be selected. The C-scan (or waterfall diagram) is a rotationally synchronized display of test signal from part circumference enabling local allocation of defects on the surface. The carrier frequency is selectable within a range of 3 kHz to 10 MHz in 21 steps. The filter frequencies of the 30 band pass filters distribute in the range of 6 Hz to 20 kHz. Manually on the instrument, via PLC or by optional start button. Highest test reliability and sensitivity – different kinds of probes for crack and grinder burn detection. Back left a rotating head eddyscan H rotating head for testing a string of parts and bars, back right a rotating head eddyscan F for testing of boreholes and surfaces. Direct control of sorting devices, paint marking systems or indicating lamps is possible with the integrated 24 V DC (2.5 A) power supply, together with the autostart function providing a low cost solution for small automated systems without an additional PLC. IO-ports An optically insulated interface with 32 in- and 32 outputs is available for PLC connection. As option, a further module with additional 32 in- and 32 outputs can be installed. An allocation of the signals to the IOs is free in the eddyvisor. Two models of eddyvisor are available: Desktop version eddyvisor D (with retractable feet, inclined) or as separated switch panel version with operating unit eddyvisor HMI and measuring unit eddyvisor M.
Completely sealed and thus suitable for rough production environmentr. 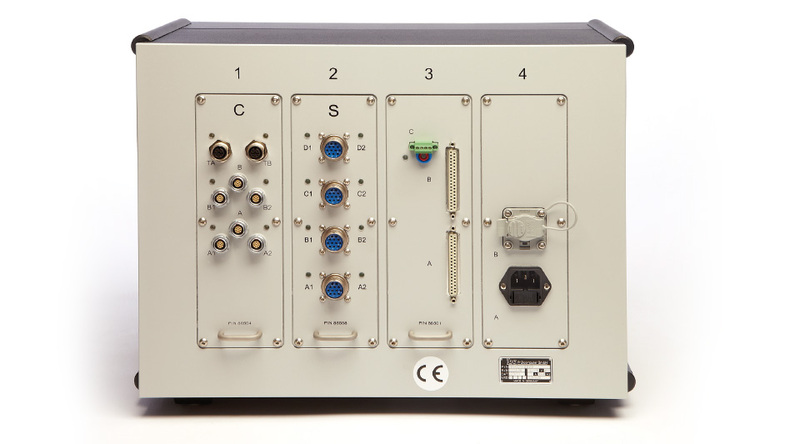 Rear side eddyvisor, equipped with (from left) crack detection module 4-channel, structure test module 8-channel, IO-module, mains.